Your Design, Our Delicious Chocolates! Throughout the year, you may want to ship chocolates to employees or friends. There may be corporate or family events that would be enhanced by a private label, chocolate gift box. The Velvet Chocolatier packaging is designed to enable you to personalize all chocolate gift boxes with your company logo, family name, or personal message. All personalized gift boxes will be trimmed with the color velvet to match your letter press tag. My box becomes yours, to be used as a corporate gift box, employee gift box, holiday or event gift box. Each box contains European inspired, handmade, Kosher chocolates. All natural, no preservatives or liquors. Review chocolate options on my website, call or email specific questions. I think this is a great way to put your private label on my award winning chocolates. 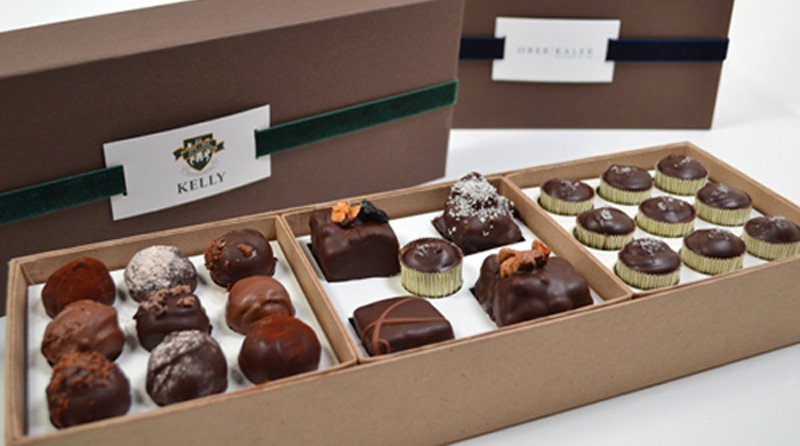 Contact us to learn more about our custom chocolate gift boxes!